A steel rule die works like a cookie cutter. It is made using a razor-sharp “steel rule” that is cut, bent, and mounted in various substrates, forming a stamping tool according to the desired shape. Substrates or “die boards” include plywood, acrylic plastic, aluminum, and steel sheets that are generally cut using CAD and precision laser cutting machines. Steel Rule Dies work by “knife cutting” parts out of material rather than shearing them as in male-female hard tooling. Occasionally unavoidable surface and cut edge effects may limit the viability in some applications. 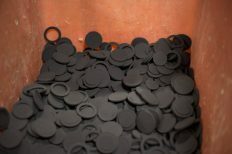 The most common of these are concave/convex edges or “hourglass effect.” This is caused by the compression and extrusion of material as the die impression is stamped, especially on rubber and closed-cell sponge materials. This all happens in a split second. The material “flows” under the pressure of the intruding force of the die before and during the cutting cycle. The die cuts straight through, but the momentary shift and subsequent recovery of the material once the part is ejected from the die leaves a concave rather than straight edge on a cross-sectional view. Because this is directly relative to the squeezing, stretching, and extruding of material under pressure, the “hourglass effect” increases with the softness and thickness of elastomeric materials. Other components of steel rule dies typically include machined punches for internal holes and ejection material (rubber or springs) mounted around cutting edges to clear cut material from the die area. When put together, the result is a precision tolerance knife-edged tool suitable for efficient production of a wide variety of part configurations and materials. In general, die cutting is an inherently unidirectional process, making it a suitable means to produce two-dimensional shapes. While this process usually involves stamping parts out of flat rolled or sheeted materials, it can be combined with other methods for three-dimensional configurations in some cases. With few exceptions, whenever stamping or cutting parts out of materials steel rule die cutting is the best available method for cost and quality considerations. 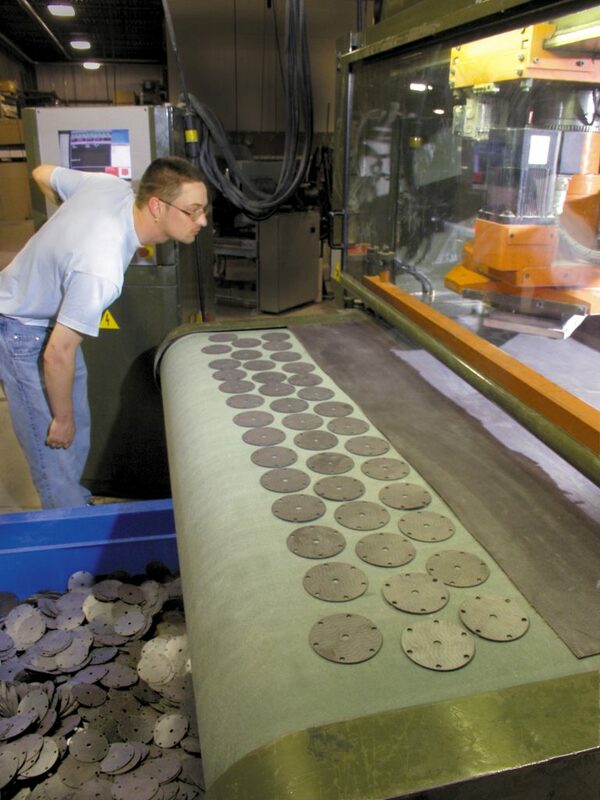 There are many methods, but none are as cost effective, versatile, and precise as steel rule die cutting. Steel Rule dies COST SUBSTANTIALLY LESS than hardened steel male-female dies (stamping dies). With our in-house tooling capabilities and inventory of dies we have the capability to have a die ready for production in a few days. 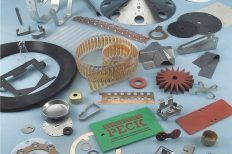 None the less at B. G. Peck we are very aggressive with our pricing because of our unique capability and experience in Steel Rule Die Cutting. At any one time we may have thousands of different materials on hand. Supplying your unique material needs for your product is seldom a problem. We have become a successful dock to stock supplier for many of our customers using our unique integrated control and monitoring system (ICMS) to bring one of the best values for die cutting into the marketplace. One of the best features of steel rule dies is the low cost of maintaining them. The cutting blade and punches can be easily replaced when necessary. Because of our in-house tooling capabilities we can make any punch change-outs or blade replacements within minutes, at minimal cost. Everything we do is designed to bring maximum efficiency and minimal cost to our valued customers. 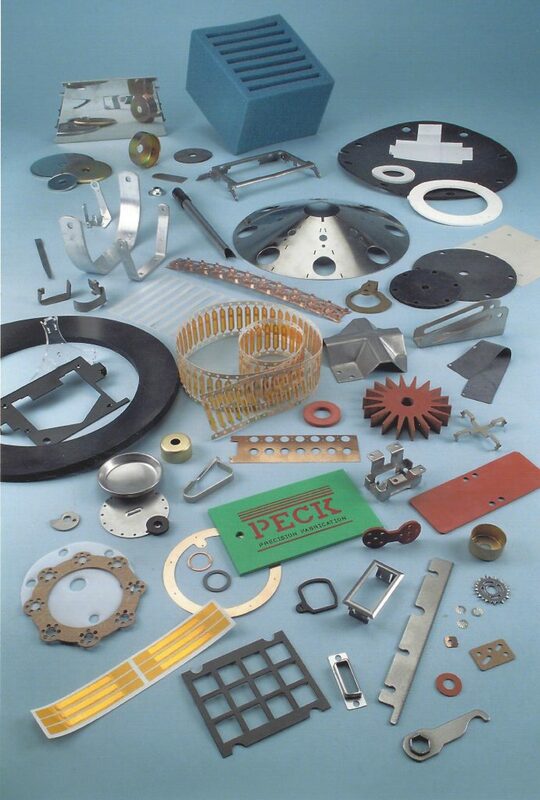 BG Peck is a leading processor of nonmetallic materials. We make our own steel rule dies to within +/-.005″. We also supply solid tooling to within +/-.001″. Steel rule dies can be used to stamp parts out of most non-brittle, nonmetallic flat materials, plus softer and thinner gauge foils, screen or wire cloth. 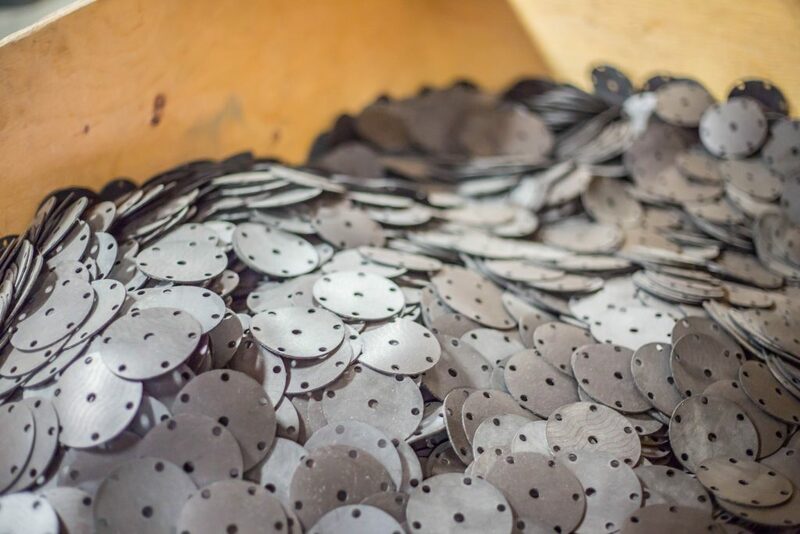 Steel rule dies can withstand hundreds of tons of pressure, so if the material can be cut cleanly (rather than shatter or break) by impression stamping and is softer than the cutting edges of the dies, it can generally be cut using this cost-effective method. Many die cut parts have internal configurations, which must also be cut. These configurations can range from a single hole or complex shape, to multiple holes around the periphery of the part, or holes on a bolt circle. There are no preferable hole sizes other the use of standard available sizes that typically vary by 1/64″ increments, to keep tooling cost down. The minimum radius that can be bent is 1/32″, and is often used when cutting mesh materials that don’t cut properly at standard corner joints (polyester and fiberglass mesh for example). The 1/32″ radius also appears to be a square corner unless carefully inspected. Sharp corners allow for better yields by nesting parts together in the tool. There are practical limits to how many holes can be present. Edges should be 0.125″ apart. This number can be higher depending on the diameter of the punch and thickness of material. Another issue can arise with very thin materials; is that the material between very close holes cannot support itself, and breaks during cutting. If you are uncertain as to the exact specifications you can contact a BG Peck engineer to help clarify requirements. 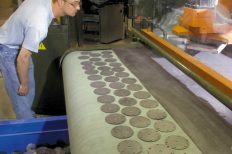 We can construct our dies out of a number of different materials based upon what materials are being cut and the life expectancy of the job itself. Material characteristics are a major consideration and our engineering staff is ready to assist you should you require assistance.